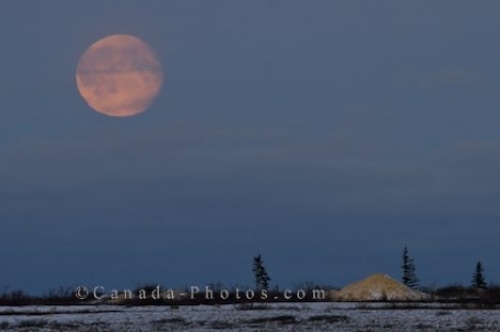 The full moon hangs over the landscape of Churchill, Manitoba and brightens up the area enough to capture a picture. When the moon is full, it emits an incredible amount of light and as this full moon rises above the landscape of the Churchill Wildlife Management Area, it brightens up the entire wilderness area. Thin clouds float across the face of the moon with thicker ones forming in the backdrop as the icy surface of the tundra lights up, creating the ideal opportunity for a picture. Full red moon over the tundra in the Churchill Wildlife Management Area, Hudson Bay, Churchill, Manitoba, Canada. Picture of the moon in its full phase above the Churchill Wildlife Management Area in Churchill, Manitoba in Canada.